* eg. Kalamata, green, sundried (with or without pits). Do not use stuffed olives. 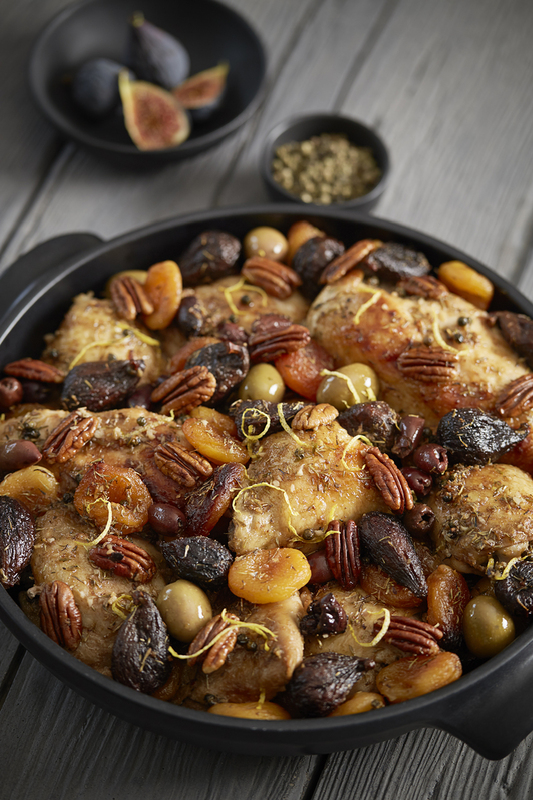 Put chicken, peppercorns, olives, apricots, and figs in a large re-sealable bag. Pour marinade over chicken. Seal bag and gently turn it so chicken is completely coated. Refrigerate overnight. Remove from the fridge 1 hour before cooking. Arrange the chicken in a single layer in a large shallow baking dish. Add in the peppercorns, olives, apricots and figs and pour the marinating liquid evenly over the chicken. Sprinkle with sugar, and pour the Madeira (or Port) between the pieces. Cover the dish tightly with foil and bake for 20 minutes. Remove foil and bake, basting frequently with the pan juices, until a digital thermometer reads 170F in the largest piece of chicken (about 40 minutes). Remove from oven and baste chicken once more. Top with pecans and lemon zest. Serve with quinoa or couscous.